Samsung 2019 TVs: 8K, 4K, Full HD, QLED and LCD – everything you need to know | What Hi-Fi? The result is the Q90R, which adds OLED-like black levels and viewing angles to its already exceptional list of strengths. The Q90R leads the line in terms of 4K QLEDs, but Samsung also has a refreshed 8K model above it, the Q950R. The other 4K QLEDs in the range sound more impressive than ever, with almost all models getting a full array, direct LED backlight, and all getting the new Quantum Processor 4K. What's more, while there are currently no OLEDs available that are smaller than 55in, this year's QLED range includes two 49in models and one 43in. That's great news for those who want a top-notch set, but don't want to turn their lounge into a cinema. 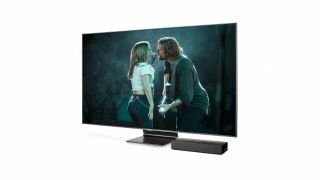 And, while most of the excitement will understandably be centred around the QLED models, Samsung once again has a full range of more affordable LCD sets below them. These are RU sets in the UK, and RN in the US. Every 2019 Samsung TV will run on the same, custom-made operating system. On the surface this is just an evolution of the existing Samsung OS, but that doesn't seem a problem when you consider how fully featured and intuitive the user-experience is already. What's more, there are some neat additions, from enhanced modes for gaming, more options for the turn-your-TV-into-an-art-display Ambient mode, and the addition of iTunes Movies and its peerless selection of 4K HDR films. Speaking of HDR, it's unsurprising but still disappointing that Samsung is sticking to its guns and not supporting Dolby Vision. It's rival HDR10+ format is there instead, but time will tell whether that's ample compensation – implementation still seems rather inconsistent, based on our experience with the Q90R. Of course, you do also get standard HDR10 and HLG. If it seems strange that Samsung would replace its 8K models so soon after their October 2018 launch, consider how much stranger it would be if the company's flagship 8K sets lacked some of the features of its new 4K models. The Q950R, available in 65in, 75in and 82in versions, is more or less a Q900R with the new, viewing angle-improving technology of the Q90R – according to Samsung anyway. We were slightly disappointed with the colours of the Q900R, so hopefully Samsung has also made the Q950R closer to the Q90R in that regard. If it has, this could be an 8K set to crave. Confusingly, US customers won't be able to buy a Q950R set, but the Q900R sets available there will be upgraded to Q950R spec. The Q90R is Samsung's flagship 4K QLED model, and comfortably the best Samsung TV we've ever tested. On paper, it doesn't appear to be a massive departure from last year's Q9FN, but by improving the viewing angles, black detail and colour balance, Samsung has come up with a set that plays its OLED rivals at their own game and leaves little room for criticism. This is a belter of a telly that, short of 8K, represents the pinnacle of Samsung's TV tech prowess. Few other manufacturers have showed their 2019 TV hand (in that they've not yet sent samples for review), but the Q90R has set a benchmark that's certainly going to be tough to beat. The big difference between the Q85R and the Q90R is the lowering of peak brightness from 2000nits to 1500nits, and a reduction in the number of dimming zones. Samsung hasn't confirmed numbers for the latter, but the reduction is likely to be significant: we expect the Q85R to have only around a fifth of the zones of the Q90R, which will undeniably affect contrast. With much lower prices, though (the 65in Q85R is £800 cheaper than the Q90R equivalent), that might be a worthwhile compromise, particularly as you appear to get everything else that makes the Q90R great. And if you're wondering what the difference is between the Q85R and Q80R (below), it's the One Connect system, which moves all connections to a separate box that's connected to the display via an almost impossibly slim cable. The Q85R has it, but the Q80R doesn't. The Q85R is, at least for the time being, a Europe-only model. The Q80R is more or less the Q85R above, but without the One Connect box – which means all connections are in the back of the TV as with any non-Samsung model. Your reward for opting for the simpler, less tidy connections is a hefty discount: the 65in Q80R is currently listed for £500 less than the equivalent Q85R. This is where the 2019 QLED range opens up in terms of sizes, with 49in to 82in models available. Prices come down, too. The sacrifices are the peak brightness, down to around 1000nits, and the number of local dimming zones, which is around half that of the Q80R above. The Q70R also does without the enhanced viewing angles of the more premium QLEDs, so expect to lose some colour vibrancy and black depth as you move off axis. Here, the direct LED backlight available across most of the QLED range is replaced with an edge LED backlight that will inevitably result in a comparative loss of contrast and local dimming. On the plus side, prices are lower and this is the one QLED model available in a 43in size. This is where QLEDs end and the LCDs begin, and prices get a bit more affordable. The RU8000 is the top model in the LCD range, offering 4K at sizes ranging from 49in to 82in. These models lack the quantum dot colour reproduction of the QLED models, but they do have what Samsung calls 'Dynamic Crystal Colour'. The One Connect system is missing, as is Ambient Mode. The user experience should otherwise be just as smooth and substantial as on the company's most expensive sets, and that could help make the RU8000 a real contender in its class. UK prices for the RU8000 aren't currently available, but in the US the range starts at a reasonable $800. The RU7400 is similar to the RU8000 above, but lacks the Wide Viewing Angle tech (which isn't the same as the Q90's viewing angle feature) and is available at one extra size – 43in. It's still a 4K, edge-lit model, with the same UI as all of Samsung's TVs. The curved TV clings on in the Samsung range in the form of the RU7300. This model is available in just three sizes – 49in, 55in and 65in – and apart from the curve, differs from the RU7400 only in terms of colour reproduction (this model has 'Pure Colour' rather than 'Dynamic Crystal Colour') and the remote, which is comparatively basic. Taking the spot at the bottom of Samsung's 2019 range is the RU7100. Available in six sizes, ranging from 43in to 75in, every RU7100 model is 4K, supports HDR (in HDR10, HDR10+ and HLG forms) and uses a combination of LCD panel and edge LED backlight. Like the RU7300, the RU7100 has 'Pure Colour' rather than 'Dynamic Crystal Colour' – how significant that is will only become clear once we get the samples in for review.